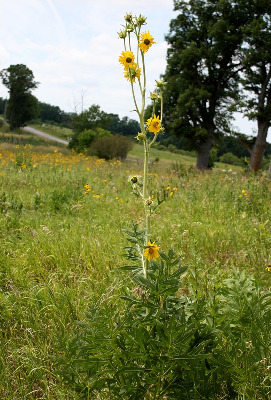 Like S. perfoliatum, mostly to the south and west of Michigan. At least in part probably adventive along railroads (e.g., Jackson, St. Clair, Washtenaw, and Wayne Cos.), although railroad rights-of-way and depauperate prairies are indeed about all we have left of its proper habitat. The common name refers to the tendency of the lower leaves to orient themselves vertically in a north-south direction when exposed to full sun (thus escaping the full radiation that a horizontal leaf would receive). MICHIGAN FLORA ONLINE. A. A. Reznicek, E. G. Voss, & B. S. Walters. February 2011. University of Michigan. Web. 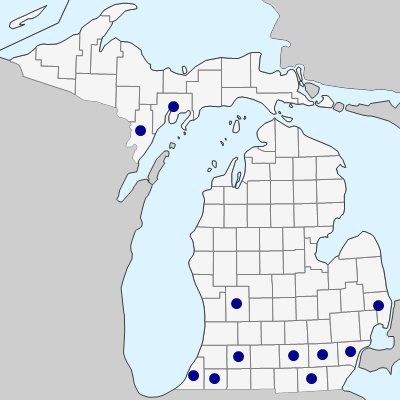 April 19, 2019. https://michiganflora.net/species.aspx?id=446.